Mac has installed thousands of homes with new upvc fascia, soffits and gutters throughout South Wales -since 1998 – each and every day. All of our professional experienced roofline installers have been working with Mac since the day we started and each are experts in their trade. Mac Home Improvement’s main goal is to offer the best quality products at the best possible prices in a thorough manner- so that it is a job done only once. 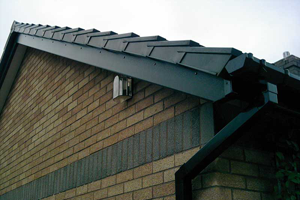 At Mac Home Improvements we will also install an eaves protection tray- this is designed to ensure rainwater is guided directly into your guttering. We will also consider the ventilation needs of your roof and install the best system to allow it to ‘breathe”. All of the Fascia boards that Mac use are 18mm replacement boards ensuring a roofline that will last for years and years to come. We are constantly researching and staying up to date with new designs colours and more innovative products – to ensure that you get the best that is available. Our upvc roofline products are available in the widest range of colours, all of which have guaranteed Colourmax technology. Mac has something roofline products to compliment traditional homes and homes that are a little more contemporary. We know that whilst you want your new roofline to do its job and keep water away from your home- we also recognise that you also want it to add to the look of your home and compliment it. New roofline can increase the value of your home and make it cheaper to maintain in the long run (no more painting!). If you want more information just give us a call – or fill in the contact form with your query- we will get straight back to you. Don’t worry- even if you are not thinking about doing anything yet- and are just getting some ideas- we are happy to help. So if you are in Newport or the surrounding areas and need advice on your fascia and guttering get in touch!